Most of the reputed companies follow a certain type of recruitment process while searching for a suitable candidate. That can be internal recruitment and external recruitment. The internal job posting is a recruitment process where a candidate is selected for the job who is already working in that same company. In other words, internal job posting process finds a candidate among the employees of the company. It delivers a sense of support from internal employees of the company. There are several advantages of the internal job posting. And some of the advantages of internal recruitment is very essential for the overall and structural growth of the company as it mainly employs candidates within the company. Hiring a candidate who is capable of handling all the required duties and responsibilities of the company can follow a certain type of the selection procedure of internal job posting. In this internal recruitment, the company fills in all the necessary posts of the company by choosing employees of their own company. Therefore, this makes things easy for the employer because existing employees understand everything about the company. As the company decides to find a suitable candidate within the company, it makes things easier for that existing employee because he/she is already aware of all the working nature and environment of the company. And even the company can be beneficial because the employer knows all the skills and ability of that particular existing employee. And this decision of employing an existing employee through internal recruitment method is one of the important and intelligent decisions of that particular company. Most of the existing employees of the company experience some sort of comfortable working conditions in the company. And if that employee is put in different work post, the working condition may not differ much. Most of the existing employees of the company understand the working routines of the company and they feel comfortable in their current working conditions. In the internal hiring process, the company decides to hire those employees who were already a part of that existing company. And in that group of existing employees, the employers recognize the suitable skilled candidate who is capable of handling that particular job. Therefore, internal job posting provides a better career growth in the existing company and it also provides job satisfaction to the existing employees with the better pay structure. Most of the time in any type interview and selection procedure the company goes through several kinds of selection process and these selection processes require time and energy. But if the company decides to go with the internal job posting then it reduces interview time. That is possible when the candidate selected for the position is an existing employee of the company and the company knows all the details and abilities of that employee. As the company decides on selecting a candidate within the company then the company will spend less on the recruitment process and expenses. And in another way, the company understands all the need and requirement of that particular employee and that is why they come up with a good feasible deal for that existing candidate. It is not necessary that the employee must compromise with his / her pay scale, but actually, the company can provide better pay structure. If the employee working in the company receives a proposal from the company to take up the best position in that existing company then it is quite obvious that particular employee would deliver and build unconditional respect and loyalty for the company. Therefore, when a company understands all the skill and abilities of that particular employee then only he/she will be selected for the position with better pay scale and this makes that employee forever be in a debt of that company. There are several disadvantages of internal recruitment when the company decides to select a candidate within the company for the post within the company itself. These disadvantages can make a clear distinction between its limitations and benefits as well. As the company decides to hire an existing employee from their own company, that time the employer plans all the work structure of the company. And if the employee makes a valid comparison between internal and external job offer, then there is a possibility that the employee may end up getting a better-paid job from outside the company. Therefore, when an existing employee receives an approach within the company then the employee might lose a chance of getting a better job in another company. Most of the company believes that in internal job posting policy, there is a possibility of lower risk in terms of their own employees. And when the company moves forward this internal job posting decision, the company will come up with a game plan for that employee. The employee who receives an approach from the company might have some sort of weakness within himself/herself and the company can take advantage of that weakness to convince him/her to take the offer. When an existing employee receives an approach from their own company to take up a different position in that same company, the existing employee might prune to increase competition among the employees of the company. And this can eventually make things worse for the existing candidate that he/she can face a difference of opinion or differences of thinking with his/her own fellow workers or employees. As per the working environment of the company, there is a different type of employees working for the company. In that bunch of working employees when an employee receives a promotion or job hike, then that employee might be targeted easily by his/her fellow employees. As the employee selected was a part of the working group, there is a mere possibility that there will a change of behavior among the employees of the company. Most of the company with the internal recruitment process can be aware of the fact that the candidate selected for the job might have to compromise his/her growth in that same company. And another way, if the candidate takes up the offer from the outside part of the company then there will be a huge variety of career growth in a different company. Therefore, the existing employee needs to compromise with his/her career growth in the same company. When a company hires an employee for the position in the company and selects him/her from within the company then that employees need to understand that the company identifies all the abilities and skills of an employee. And eventually, the employee will be hired for the post offered. The company might also show some sort laid-back attitude while explaining him/her about the work or the post. Most of the time the company follows an internal job posting technique while choosing a candidate for the post. And in that working technique of internal job posting, the company will be a profit position and the existing employee might be in a risky position. Therefore, it is very much necessary for the employee that he /she should think before taking up such decisions about continuing working in that same company. The decision about hiring an employee from their own company is not just risky for the employee, but unfortunately it is too risky for the company as well. And that is because when the company continues that same employee in the new and better position. There is a greater possibility that the employee might be a negative part of the generation of creative ideas. And continuing that same employee with a better position is not going to favor a company who is in need of generating new and improved creative ideas. 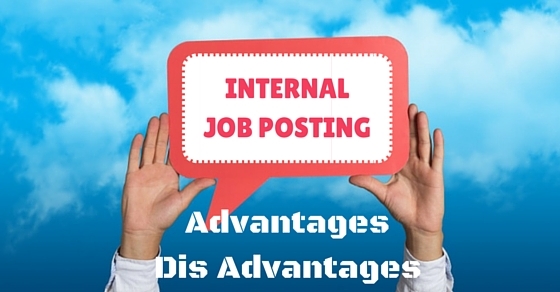 The bottom line is that after all the elements of discussion about the advantages and disadvantages of the internal job posting. A person might be slightly confused about all the facts of an internal job posting. Therefore, it is necessary for that person as he/she needs to be aware of all the advantages and disadvantages of the internal job posting. After clearing all the confusing matters of the above-mentioned topic, that person can make use of such internal job posting availabilities.